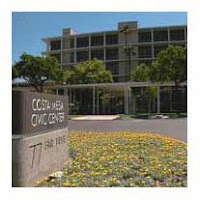 The agenda for the Costa Mesa City Council meeting scheduled for Tuesday, March 19, 2013 is now available for review, HERE. As is usually the case, it's full of interesting information, some of which raise more questions than answers. The closed session begins at 5:00 p.m. and includes three items: Conference with CEO Tom Hatch on pending labor negotiations; a request for Special Leave of Absence for an un-named employee and the CMCEA lawsuit. At 6:00 the regular meeting commences and will have yet another Mayor's Award and a presentation by the Orange County Vector Control. The Consent Calendar - items that might normally be voted upon as one vote without separate discussion. Unless someone - a council member or member of the public - pull one or more of them you might not hear a word about them. Mayor Jovial Jim Righeimer has clearly stated his preference that nobody pull anything because it prolongs meetings. Fortunately, we are in a representative Republic, not a dictatorship. Within the Consent Calendar we find in the Reading Folder six (6) separate items dealing with alcohol licenses - 3 original licenses and 3 person-to-person transfers. 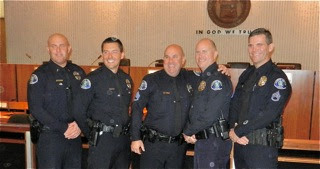 Is anyone surprised that members of the Costa Mesa Police Department consistently lead the pack in DUI arrests? Of interest on the second warrant is the fact that we paid seven (7) planning commissioners $400 each for February, 2013. We paid Colin McCarthy, Sam Clark, Jim Fitzpatrick, Ed Salcedo, Rob Dickson, Jeff Mathews and Tim Sesler for service in February. We have a five member Planning Commission. Yeah, I know... they each did serve in February, but maybe this shows a fault in our commission payments. The Costa Mesa Planning Commissioners are among the highest, if not THE highest, paid in the county. Most commissioners get paid per meeting with a cap. These guys get paid by the month for what is basically a volunteer job. Item #6 on the Consent Calendar is interesting, HERE. This one is a request from Recreation Manager Bob Knapp to the council to pass a resolution to change Parks and Recreation Commission meetings to once a month from once every other month and change the meeting date to the fourth Thursday of the month from the fourth Wednesday. There would be no meeting in December and the November meeting would not fall on Thanksgiving Day - it would be re-scheduled. The only justification I can find in the staff report is statement down in the Analysis section where this sentence is included: "Changing the meeting date to the fourth Thursday, and reestablishing the meetings on a monthly basis will allow for greater participation by the community and accommodate the Commissioner's schedules." That's it! No mention of anticipated greater workload in the way of upcoming projects, more tree removal requests, etc. Nothing, nada. So, I looked back at recent history to see if there's a trend of longer meetings that might justify this change at this time. Last year the Parks and Recreation Commission met five (5) times and those meetings averaged less than two hours each. Going back to 2011 it met seven times, including two special and/or joint meetings and averaged just over 2 hours each. So, without more justification, I fail to see why the Parks and Recreation Commission needs to meet more than once every other month. And this "accommodate the Commissioner's schedules" stuff seems bogus. Every one of them knew when the meetings were scheduled and how frequently. If their schedules didn't work they shouldn't have applied in the first place, for goodness sake! The final item on the Consent Calendar might be interesting for you to review. It's a proposal to pay almost $60,000 for "Professional Design Services For Redesign Of City Hall Lobby, Police Department Lobby, Directional City Signage and Design Concepts for City Clerk's Office, Council Chambers and the Closed Print Shop Space." You can read that staff report HERE. Now, don't get me wrong, each of those area need attention, but the justifications provided seemed just a little over the top to me. What do you think? Then we finally get to the "real business". Old Business #1 is the second reading to the ordinance originally heard and passed unanimously on March 5th related to emergency shelters and supportive and transitional housing, HERE. New Business #1 is a VERY interesting. The staff report, HERE, includes modifications of our ordinances and creates an entirely new section to deal with "Camping and Storage of Personal Property in Public Areas". This change appears to finally put some teeth into resolving at least part of the Homelessness issue in our town. Unknown at this time is the amount of staff time - police, code enforcement, etc. - that will be involved enforcing this one. This is going to be a very interesting process - one that will likely set the course of this city through the end of this decade. I'm hoping that they don't begin this discussion at 10:00 p.m. or later - it's too darn important. I also suspect councilwoman Sandra Genis will assert her knowledge very heavily into this discussion. This segment of the meeting alone may be worth the price of admission. 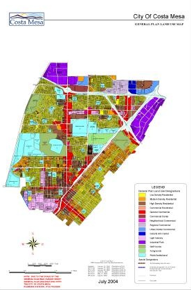 Last night I attended, along with five (5) other residents, the workshop hosted by the Costa Mesa Sanitary District at the Neighborhood Community Center intended to provide information about the proposed sewer rate increase planned for later this year. CMSD General Manager Scott Carroll and consultants John Farnkopf and Richard Simonson - hired to provide the study that resulted in the proposed rate restructuring - were joined by Directors Jim Ferryman, Bob Ooten, Mike Scheafer and Arlene Schafer in a free-flowing, casual discussion of the issue with us. Handouts included the 25-page Sewer Rate Study, available for review on the CMSD website HERE, and a FAQ sheet, HERE. Unfortunately, because the study is necessarily founded on assumptions instead of measurable facts, some of the attendees probably left dissatisfied. I suspect some of you will feel similarly if you take the time to plow through the detail of the report. The proposed new rate structure will remedy what the consultants perceive as an inequity between what residential users pay versus what commercial users pay to move their sewage. The rates proposed for beginning with the fiscal year 2013/2014 will theoretically adjust that inequity - single family residential users will carry a greater portion of the burden. Their rates will go from $69.00 per year to $85.34 - a change of just over 16%. Here's a chart from their FAQ sheet that displays the changes proposed. Click on the image to enlarge it. Some attendees attempted to turn the meeting into a budget discussion, questioning District costs, salaries, pensions, etc. Of course, while the questions may be valid, this was the wrong venue. We were there to be briefed on how the new rates were established - and we received that information. The District will be beginning their budget discussions soon and Carroll invited the public to attend those meetings at the District Headquarters. Most of us received the required notice of the public hearing proposing these rate adjustments. And, we also received a notice from the Orange County Sanitary District about THEIR plan to also increase rates. So, this will be a double-whammy for sewer processing rates. The hearing on THAT increase will be held later this month. 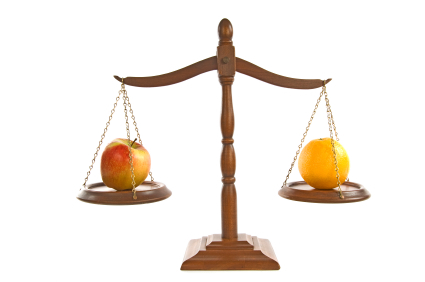 Residents who oppose the CMSD rate increase may formally oppose it by writing to the District. At one vote per parcel it will require more than 13,000 parcel owners - half of the total number of parcels covered by the CMSD - to protest and halt this increase. Based on the turnout last night, I think the chances of that happening are pretty darn slim. I looked through all the information provided and listened to the questions and answers last night. At this point, I think I understand the methodology and the need for the rate increase. If you review the information on the website and still have questions contact the District. 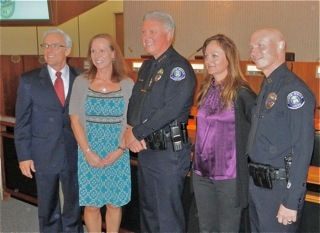 This morning I had the great honor to attend a ceremony in city council chambers at which Costa Mesa Police Chief Tom Gazsi recognized the promotions of several staffers, the hiring of others and the retirement of two men with accumulated services years nearly equal to the age of our city. The auditorium was packed with well-wishers, residents and city staffers. 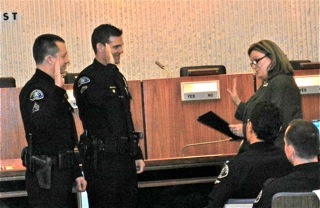 Fifteen officers/civilian employees were sworn-in for their new jobs by Interim City Clerk Brenda Green, ranging from new Captain Rob Sharpnack to brand new electronics technician Ricardo Alvarado. Retiring CMPD staffers Lieutenant Tim Schennum and Captain Allen Huggins were honored for their nearly 3 decades of service each. Both men are looking forward to their retirement. In addition to Sharpnack, the promotion list also included new lieutenants Keith Davis, Paul Beckman and Greg Scott; new sergeants Doug Johnson and Scott Stafford and Records Shift Supervisor Lidian Estecoc. 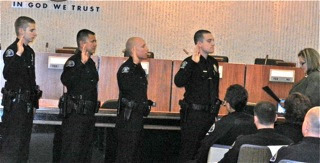 New police officers Curtis Hazell, Arnold Alegado , Ryan Novikoff and Jonathon Tripp were also part of this ceremony. 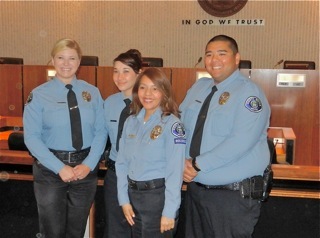 New Community Service Specialists Amanda Seers, Jessica Jung and Alec Tanchauco also received their badges. 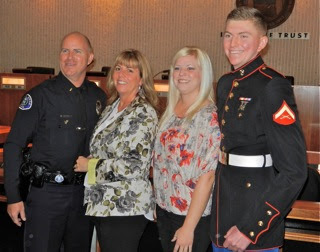 The ceremony was a true family affair, with wives, children, parents, siblings and significant others filling the auditorium to see their loved-ones swear to protect and defend us. The cornerstone of each ceremony was the pinning of the badge on the chest of each individual. We saw wives pinning husbands, fathers pinning sons, mothers pinning daughters, brother pinning brother, son pinning father, boyfriend pinning girlfriend and Chief Gazsi pinning one individual, too. I had to chuckle because, after new Sergeant Doug Johnson was pinned by his wife, Monique Beckner - also a member of the CMPD - she gave him a smooch, then walked back to her seat with just the slightest hint of a blush on her cheeks. I told her later that I can't remember the last time I saw a cop blush. I also asked her if she was now required to salute her husband since he outranked her. The answer was, "He's a sergeant at work, but I'm the commander at home." Perfect! There were many, many highlights for me this morning, one of which was the inclusion of former chief Roger Neth in the ceremony. He spoke briefly about being the very first officer hired by first chief Art McKenzie, and what it has meant to him to watch this organization grow. He shook the hand of every awardee before he stepped aside. At the end of the ceremony a very moving slide show about recently-deceased Detective Mike Delgadillo was shown to the audience. Chief Gazsi spoke passionately about Mike's 32 years of service and the huge hole his death leaves in the organization. There were only a few dry eyes in the auditorium following that remembrance. 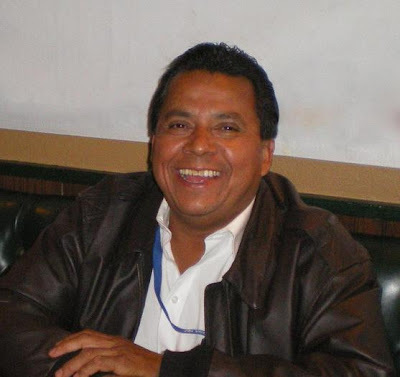 Services for Mike Delgadillo will be held tomorrow, Friday, March 15th at 11:00 at the Saint Thomas More Catholic Parish, 51 Marketplace, Irvine. GIVE IT A REST, JIM! 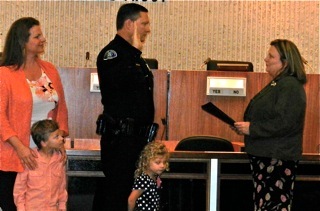 With the exception of Mayor Jim Righeimer telling the crowd that he was a member of a law enforcement family and that "this council supports the police 100%", it was a very good morning. The mayor should be reminded that actions speak louder than words, and that talk is cheap but excellence in law enforcement is not. Thanks to all those brave young people who step up and protect and serve us every day. I left the proceedings feeling a great sense of pride in the CMPD, and knowing that we are in good hands. In the past I've referred to Mayor Pro Tem Steve Mensinger and Planning Commission Chairman Jim Fitzpatrick as Don Quixote and Sancho Panza, respectively because Fitzy always seemed to be glued to Mensinger's hip, providing a supportive echo to almost every utterance he made. Today retired Costa Mesa resident Jeff Arthur, who has become a fairly regular fixture at recent City Council meetings, published a commentary in the Daily Pilot, HERE, in which he spouted the party line - that the sky is falling in the form of unfunded pension liabilities - and quoted Stanford professor Joe Nation extensively. Nation recently held forth at a Study Session during which he painted a picture of gloom and defined some draconian measures to solve "the problem" - creative stuff, like raising taxes - just the things you'd anticipate from a self-avowed "progressive". All of a sudden the comment thread on this commentary exploded, first with a comment by Mensinger lauding Arthur for his views. Further down Fitzpatrick, who is apparently on the road to recovery from his post-Costa Mesa Sanitary District Board ouster funk, opined that the problem must be serious "when a Pension beneficiary like Jeff Arthur starts sounding the bell.." What does that mean, exactly, Fitzy? Do you mean pensioners have a better perspective than those of us who actually pay for the pensions? 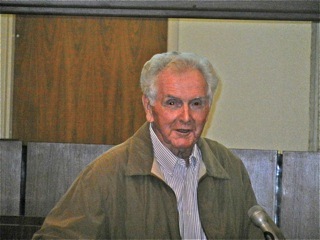 Later Mensinger made an almost incomprehensible comment - he does that - that added nothing at all to the discussion. In my opinion, it is unseemly for an elected official to mix it up on comment threads in the public press. It has more than the slightest whiff of bullying, but it's his right to do so. And, as several of his friends have told us from time to time when he did something stupid, "Well, that's just Steve". So, he gets a pass because he always has... Very sad for us all. The Costa Mesa Sanitary District recently announced a rate increase, followed on the heels by a similar announcement by the Orange County Sanitary District. Tomorrow, Thursday, March 14th at 6:00 the Costa Mesa Sanitary District will hold a workshop for all ratepayers to discuss their pending increase. 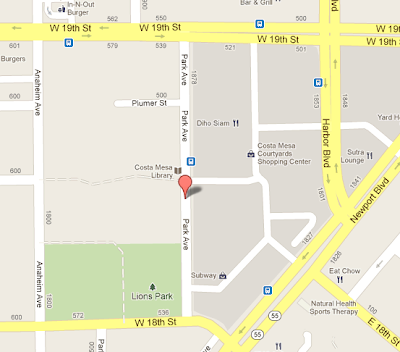 It will be held at the Costa Mesa Community Center, 1845 Park Avenue (Lions Park). Here's a map. I was unable to find information of the proposed rate increase on the CMSD website, but HERE is a link to the page that shows both trash and sewer rate history for your reading pleasure. The City of Costa Mesa has, for the second consecutive year, been awarded the Sunny Award by the national nonprofit organization, Sunshine Review. The full city press release is HERE. This award honors the most transparent government websites in the nation. According to the press release, Costa Mesa was only one of 22 cities nationwide to earn an A+. Huntington Park also received a similar score. There is MUCH more information easily available on the website today than ever before. That's a mixed blessing for some. 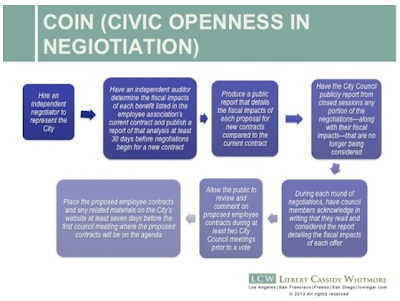 For example, Mayor Pro Tem Steve Mensinger's COIN scheme has a page on the website, HERE, that includes many other links to informative pages. The chart they recently included is helpful, but I still have concerns about how this process is going to work, and whether it will be an anchor to the negotiating process. We'll find out soon enough because the contract for the General Employees expires the end of this month. Last night the Costa Mesa Planning Commission met to do the city's business for their only scheduled meeting this month. Watching the meeting I learned a few things I didn't know before. For example, apparently it is possible to present award - the Mesa Green Design Award, specifically - intended to recognize a PROJECT for its green impact on our city, to a person. Tonight Chairman Jim Fitzpatrick presented the award to employee Khanh Nguyen, the city Building Official. (photo show him receiving another award five years ago) As I've said before, this seems like a corruption of the award - certainly the intent of the award. Yes, the contribution Nguyen and his team has made in facilitating plan checking and inspection is quite significant and, yes, recognition is certainly appropriate - just not this particular award. We also learned that Chairman Fitzpatrick is taking on the mantle of "activist". He said, "I have always believed that commissioners should be active and not just read the staff report and vote yes or no, but they should have projects and things that are important to them in the community and things that are important to residents and businesses." He went on to say, "My intention is to roll up my sleeves and work on motels within our community. I think there are a lot of opportunities to improve the quality of life here by focusing on motels." He went on to encourage his fellow commissioners to find issues and roll up their sleeves, too. As anticipated, the commission pulled the item from the Consent Calendar dealing with the parking issue at The Camp and approved without comment the balance. The discussion focused on the on-going parking difficulties at that retail center, the extensive use of valet parking and off-site employee parking. Commissioner Colin McCarthy emphasized the broader issue of under-parked retail centers throughout the city during the discussion. The commission went round and round discussing the request for extended hours and valet parking for this facility. The request was to permit the restaurant to remain open until 2:00 a.m. and would including valet parking. When the item was passed, 5-0, it included a proviso that the staff bring back an analysis of the operations as approved at the September meeting. The next item was the Beach Hut Deli, located just down the street at the corner of17th Street and Irvine Avenue. Once again, the applicant wants to serve alcohol on the patio fronting on 17th Street and extend the hours. This center, which has many food establishments, has an on-going parking issue during peak hours despite a recent renovation of the parking lot that added approximately 8 spaces. McCarthy expressed concern about "intensity of use" due to the alcohol sales, but it was satisfied by an explanation by the applicant who told them that another business in the center no longer sells alcohol. The commission resolved any concerns about parking and outdoor service of alcohol and approved the request, 5-0. The final item on the agenda, the conversion of new construction condos on Pacific Avenue to ownership units. It breezed through the process and was approved, 5-0. McCarthy was euphoric about this opportunity for more ownership units in Costa Mesa, which - according to McCarthy - has the worst ratio of rentals vs. ownership units in the entire county. 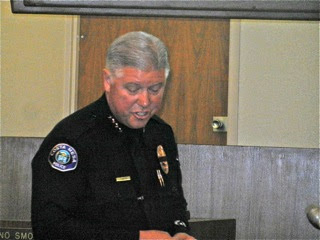 Vice Chair Rob Dickson closed the meeting in honor of recently-deceased Costa Mesa Detective Mike Delgadillo for his service and dedication to the community... a nice touch. The City recently advised us that donations may be made to Mike's family - his four children, ages 14 to 20. 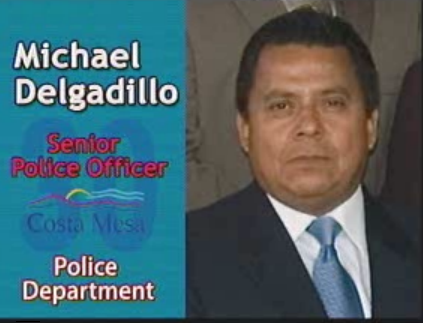 Those donations may be made out to the Costa Mesa Police Officers Association Survivors Fund on behalf of Mike Degaldillo and either forwarded to the Costa Mesa Police Department or mailed to the CMPOA at P.O. 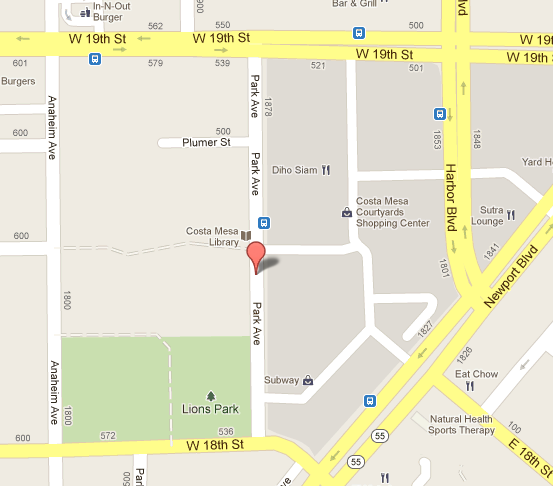 Box 1742, Costa Mesa, CA 92628. We are reminded that they have no one actively soliciting donations from the public. Donations should only be made through the CMPOA Survivors Fund.